We're delighted to welcome some stunning new pieces from Bagno Design and in this blog we've picked out some of our favourites to share with you. Helping to create unusual and eye-catching bathrooms, Bagno Design's portfolio features creative and practical solutions in a wide variety of materials and finishes. The brand's full collection encompasses every area of a bathroom's design, including sanitaryware, brassware, showering, furniture and accessories. We've been fortunate to offer Bagno Design products to customers for a number of years and it remains one of the most must-have brands in the bathroom industry. 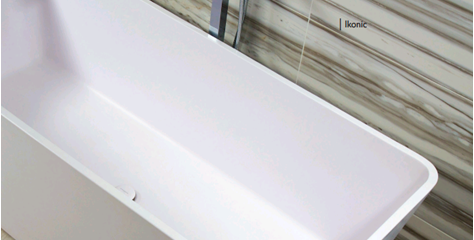 Every season, Bagno Design unveils new collections which showcase unique designs that appeal to a variety of tastes. Bangotec boasts a range of composite baths and basins that comprise of a blend of stone, marble and polymer resin solutions. Each piece is individually hand finished, crafted to perfection with the constant and meticulous involvement of our dedicated design team. Freestanding basins such as Love, Faith and Serenity are very distinctive and are perfect for modern surroundings. This style will become a lot more prominent over the next year or so, and so why not be ahead of times and opt for one today. The Pigalle countertop basin is unlike anything most people have seen before and works fantastically well as a pair – demonstrated below. In the Bagnotec range are also some cutting-edge freestanding baths which would work in a variety of bathroom environments. Available in a range of sizes and styles, there is sure to be something for your taste. This blog gives just a small taste of what Bagno has launched for 2017. For more information, please visit our Cheadle showroom or call us on 0161 485 1373 – we're open 7 days a week!